Am I being honest with myself? Completely, unreservedly honest? And how will I know when I am? Because if I’m not being honest with myself, I can’t be totally honest with anyone else. It seems so many things get in the way of absolute, rigorous honesty. There’s my ego and my desire to have things my way. There’s my idealised picture of how I want my life to turn out and how I would like those in my life to be – in other words, my control. And there’s my fear that things won’t turn out as I think I would like them to if I’m completely honest with myself and others. It’s a subtle dishonesty, born out of fear and insecurity, and it starts with myself. I know I’ve written on this topic before – it’s interesting how certain themes recur in my life and in this blog – and it ties in with my previous post on Living with integrity. But it’s come up again, particularly in the context of dating but also around work and career. Once again, I’m realising the crux of the problem is that, despite everything I’ve learned over the years, I’m still trying to live according to my plan. I have an image of how I want my future to be and I’ve very invested in that image and am doing my best to bring it to pass. This image isn’t quite the white picket fence but, as you’ll know if you’ve read any of my blog, it’s not that far off. It involves having a partner and a couple of healthy, happy children. And I’m so attached to that image, to that ideal, that my vision sometimes gets blurred. Of course, as I’ve noted before, it’s not surprising that it’s difficult to ‘let go and let God’ in this area and I know I’m not on my own with this. It’s not easy, at 40, to surrender to life and say I’ll accept whatever comes to pass when it comes to a partner and children. But is there any other way to be? At least if we want to stay sane and true. So as I venture into the dating arena, I have to keep asking myself a series of questions: am I trying to control outcomes to ensure my dream comes true or am I surrendering those outcomes to God? Am I subtly manipulating situations to keep my plan on track or am I practising total acceptance. Basically, who’s running the show? I know the idea of not running our own show may jar with some people, particularly when almost every self-help book on the shelf is telling us we can take charge of our lives and create our own destinies. Surely, life is what we make of it? We seize our opportunities. We create our own luck. We go for it. We’re proactive. We think positively. We get a vision board and write our dreams all over it. We come up with a 10-step plan to accomplish our goals and set timeframes or join groups to keep us accountable. Now, I definitely wouldn’t argue that we need to take action to achieve what we want in life. I believe in having visions and goals. I believe in writing them down or drawing pictures of them. I also believe in doing the footwork to achieve them – be that going out on dates to meet a potential partner, networking in our career, setting time aside for our creative projects or making time to exercise if we want to get fit. I also agree with accountability groups, timeframes and other motivational techniques. I’m definitely not in favour of sitting around and expecting everything just to come my way. But for me, it’s important to keep asking myself whether I’m so set on a particular goal that I’m compromising myself, my integrity, my wholeness or my serenity to achieve it. Am I rushing into stuff without considering whether it’s right for me because I’m so fixated on that goal. And are those goals right for me anyway? Have I really thought them through? I’m reminded that we get what we need in life, not necessarily what we want. I also deserve to keep asking myself who’s running the show? Who’s making the decisions for me? Is it the mature, adult me who’s confident about what she wants and who knows what’s best for her? Is it the sane and serene me who’s in touch with her needs, with her instinct and with God’s voice and has the courage to act on it? Or is it the younger, fearful me who’s scared she won’t get what she wants or what she thinks she needs? Is it the insecure, untrusting me who feels she has to take charge, be in control and make sure everything goes according to some pre-written plan? It’s a very good question. To try to answer that, I think the first thing would be to get honest about my goals. Work out why I have them, which side of me came up with them and how attached I am to them. If I’m too attached to them, I can ask myself why and perhaps go through a gentle process of letting go of this attachment. The goal of having my own family springs to mind here. If I’m too attached to that outcome, I’m in danger of doing everything I can to bring it to pass, perhaps ignoring who I am and what I truly feel in the process. 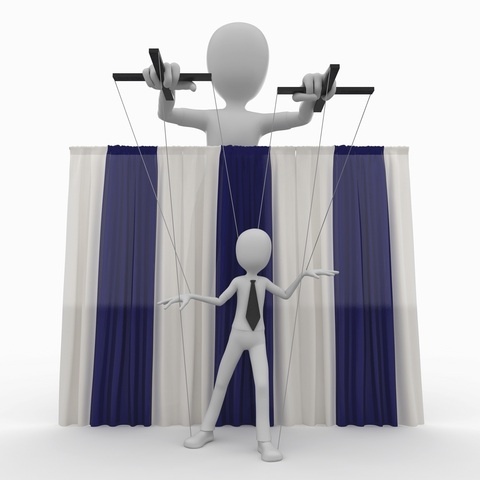 Then, as I’ve written before, it’s about spending time with myself and understanding who’s pulling the strings. And it’s about sharing out the responsibilities – taking responsibility for doing the action, doing the footwork and being true to myself while surrendering the responsibility for the end result. It’s not my job to control the outcome. I’ll give the last word to Shakespeare. This entry was posted in codependency, Relationships, Spirituality, Trust, Uncategorized, Women and tagged Relationships, Spirituality, Trust, Women. Bookmark the permalink. 1 Response to Who’s running the show? Thanks for the reminder of the Shakespeare quote Katherine. Definitely worth living by. I think mindfulness helps with the dilemmas in life too. To watch ourselves in any situation and not get caught up in habitual thought patterns and judgements is so valuable. It allows us to really get to know our true selves. And as you say, it’s so important not to get too attached to the outcome of our intentions, dreams and goals.